Objectives: To compare countries in western Europe with respect to class differences in mortality from specific causes of death and to assess the contributions these causes make to class differences in total mortality. Design: Comparison of cause of death in manual and non-manual classes, using data on mortality from national studies. Setting: Eleven western European countries in the period 1980-9. Subjects: Men aged 45–59 years at death. Results: A north-south gradient was observed: mortality from ischaemic heart disease was strongly related to occupational class in England and Wales, Ireland, Finland, Sweden, Norway, and Denmark, but not in France, Switzerland, and Mediterranean countries. In the latter countries, cancers other than lung cancer and gastrointestinal diseases made a large contribution to class differences in total mortality. Inequalities in lung cancer, cerebrovascular disease, and external causes of death also varied greatly between countries. Conclusions: These variations in cause specific mortality indicate large differences between countries in the contribution that disease specific risk factors like smoking and alcohol consumption make to socioeconomic inequalities in mortality. The mortality advantage of people in higher occupational classes is independent of the precise diseases and risk factors involved. Socioeconomic differences in morbidity and mortality have been observed in all European countries for which data are available. 1 2 Health inequalities are a common theme in all European countries, but it is uncertain whether this is a theme with major variations. There are several reasons for an interest in the degree to which health inequalities are similar or dissimilar in the different European countries. Large dissimilarities would imply that socioeconomic inequalities in health are highly sensitive to specific national circumstances. Further study might show which circumstances are most influential and could identify circumstances that could be modified through intervention. A second reason relates to the international exchange of research findings and experiences with health policies. An example is the findings from explanatory studies, most of which are from the United Kingdom and Nordic countries. 1 2 Combining research findings from different countries can provide a more comprehensive picture of the causes of health inequalities, but this is possible only to the extent that the patterns and causes of health inequalities are similar in these countries. Some degree of similarity is also required when extrapolating these findings to other parts of Europe. Only a few studies have compared socioeconomic differences in mortality according to cause of death. 3 4 A study that compared Hungary to northern Europe found that the association with educational level was relatively weak for cardiovascular disease but relatively strong for other causes of death.3 This suggested that risk factors for cardiovascular disease (for example, tobacco consumption) made a smaller contribution to mortality differences in Hungary than in northern Europe. The present study compares 11 countries from the northern and southern part of western Europe. It compares occupational class differences in mortality from specific causes of death and assesses the contributions these causes make to class differences in total mortality among men aged 45-59. This study is part of a larger project on socioeconomic differences in morbidity and mortality in Europe. 7 8 Table 1 shows data sources. Data on mortality by occupational class and cause of death were obtained from longitudinal studies or from cross sectional studies. Longitudinal studies consisted of follow up (of a representative sample) of the national population censuses carried out around 1981. Most follow up studies covered the period 1980-9, but Sweden and Italy had shorter periods. The cross sectional studies were of the “unlinked” type,9 with the death registry providing the number of deaths according to occupational class as registered on death certificates and the population census providing the corresponding number of people at risk according to the same occupational classes. All cross sectional studies were centred on the national population censuses around 1981. Nine causes of death were distinguished. As shown in table 2, the share of these causes of death in the total number of deaths varies strongly between European countries. Ischaemic heart disease is the largest single cause of death in northern countries. In France and southern countries, cancers other than lung cancer and gastrointestinal diseases are relatively important. Other causes of death have different international patterns. A common occupational class scheme, the EGP (Erikson-Goldthorpe-Portocarero) scheme, was applied to as many countries as possible.10 This scheme was developed to facilitate international comparisons of social stratification and mobility and is therefore particularly suitable for this study. EGP conversion algorithms were applied to individual data on three aspects of jobs: occupational title (by three digit code), employment status (self employed or not), and supervisory status. These conversion schemes could not be applied to the data available for Denmark, Ireland, Italy, Spain, and Portugal, but data from these countries could be made broadly comparable to the EGP scheme at the level of three broad classes: non-manual classes (including self employed men), manual classes, and the class of farmers and farm labourers. Mortality differences by occupational class were measured by rate ratios and rate differences. Rate ratios compare mortality in manual classes with mortality in non-manual classes. Rate ratios were estimated by means of Poisson regression. The regression model included a term on the contrast between manual and non-manual classes. A series of terms representing five year age groups were added to control for age. Rate differences were calculated as the absolute difference between mortality in manual and non-manual classes. Mortality rates were adjusted for age by the indirect method, with national age specific mortality rates as the standard. The rate differences for specific causes of death add up to the rate difference for total mortality. Thus, dividing the rate difference for a specific cause of death by the difference for total mortality yields a measure of the contribution that this cause makes to the rate difference for total mortality. Table 3 presents manual versus non-manual rate ratios for total mortality and broad groups of cause of death. Rate ratios for total mortality are between 1.33 and 1.44, except for Finland (1.53) and France (1.71). Broad cause of death groups show pronounced variations between countries. Differences are small for neoplasms in Sweden, Norway, Denmark, England and Wales, and Portugal; for cardiovascular diseases in Switzerland and the Mediterranean countries; and for external causes of death in Norway, Denmark, Switzerland, and Italy. Table 4 presents manual versus non-manual rate ratios for specific causes of death. Mortality from ischaemic heart disease was strongly related to low occupational class in England and Wales, Ireland, and the Nordic countries. France, Switzerland, and Spain showed large differences for cancers other than lung cancer. Class differences in mortality from lung cancer were largest in Finland and Ireland; differences for cerebrovascular disease were largest in England and Wales; and those for gastrointestinal diseases were largest in France and Italy. Figure 2 presents the contribution that broad groups of causes of death make to the difference in total mortality between manual and non-manual workers. Neoplasms contribute 27-44% of mortality differences in Ireland, France, Switzerland, Italy, and Spain. Cardiovascular diseases contribute 30-54% of the mortality differences in England and Wales, Ireland, and the Nordic countries. The contribution of external causes ranges from less than 10% in Italy and England and Wales to 21% in Sweden, 24% in Finland, and 33% in Portugal. Table 5 shows the contributions made by specific causes of death. The north-south gradient in the contribution of cardiovascular diseases can be attributed to ischaemic heart disease. In southern countries, a large part of the mortality difference between manual and non-manual classes is due to cancers other than lung cancer and gastrointestinal diseases. The contributions made by lung cancer were largest in Ireland and Switzerland; those made by cerebrovascular disease were largest in England and Wales, Ireland, and Portugal; and those made by respiratory diseases were largest in Ireland and Portugal. We have identified three major problems with the reliability and comparability of the available data on mortality by occupational class: inaccurate distinctions between manual and non-manual classes as defined in the EGP scheme; biases resulting from the exclusion of economically inactive men; and biases inherent in “unlinked” cross sectional studies. 8 9 If these data problems are different for different causes of death, they will bias the contribution of causes of death to inequalities in all cause mortality. In a series of evaluations, we quantified the potential effect that these data problems could have on manual versus non-manual rate ratios. 8 9 The potential size of error was less than 20% in all countries except Ireland, Spain, and Portugal. The magnitude of error did not vary substantially by cause of death. These errors might explain some of our results, notably those for Ireland, Spain, and Portugal, but cannot account for the large variations between countries seen for several causes of death. Potentially the largest problem relates to the exclusion of economically inactive men from the datasets of most countries. Their exclusion causes an underestimation of mortality differences by occupational class, and this underestimation is larger for chronic diseases such as respiratory diseases.8 However, we have corrected for the exclusion of inactive men by using correction factors that could be calculated for each cause of death separately.8 It is highly unlikely that any remaining bias can explain the marked variations in the patterns that we found. The comparability of registrations of the cause of death is another area of concern. Even though there are differences between European countries in the registration of causes of death, this is not necessarily a problem in this study. Registration problems could bias the results only if the degree of misclassification varied by occupational class and, in addition, if this possible association between misclassification and occupational class varied between countries. Perhaps most problematic are deaths registered as caused by ischaemic heart disease, a proportion of which may have been assigned to other disease categories. If misclassification occurs more commonly in deaths among lower occupational classes, the relative mortality of these classes might be underestimated. Can this problem explain the fact that mortality from ischaemic heart disease was not correlated to social class in southern countries? The data presented in table 3 allow estimation of the effect of adding other cardiovascular diseases (but not cerebrovascular disease) to ischaemic heart disease. This more robust group of causes of death also shows a clear north-south gradient. Relatively large class differences in total mortality occurred in Finland and, especially, France. Data from a French study showed that the large differences in mortality from cancers other than lung cancer and gastrointestinal diseases in that country can be attributed to cancers of the upper digestive tract and to liver cirrhosis, respectively.11 These diseases have excessive alcohol consumption as a common risk factor. This finding implies that alcohol consumption should be included in explanations of the exceptionally large class differences in mortality in France. In the early 1980s European countries differed in the degree to which health care was accessible to lower occupational classes.21 Financial barriers were generally larger in France, Switzerland, and Spain than in more northern countries.21 If reduced access to health care affected the survival of lower socioeconomic groups, that effect would be clearest for causes of death that are amenable to medical intervention. An example is cerebrovascular disease, in which adequate detection and control of hypertension can lower mortality. However, class differences in mortality from cerebrovascular disease are not larger in France, Switzerland, or Spain than in countries with more equal access to healthcare services. Specific national circumstances seem to be able to strongly influence the magnitude, pattern, and causes of socioeconomic inequalities in health. The prevalence, at the national level, of risk factors that have the potential to strengthen the links between socioeconomic disadvantage and premature death seem to be particularly important. This was illustrated by the alcohol consumption patterns in France and Finland. Conversely, mortality differences in Mediterranean countries seem to have been mitigated by dietary habits and drinking patterns that traditionally protected men from lower classes against ischaemic heart disease. The same caution is needed with countries' exchange of experiences with interventions that aim at improving the health of disadvantaged groups by reducing the prevalence of specific risk factors for disease. Our results for causes of death related to smoking suggest that a reduction in smoking rates may have much larger effects on health inequalities in England and Wales than in Sweden or France. The prevention of alcohol misuse by men in manual classes deserves a higher priority in France and Finland than elsewhere. This paper shows that in southern countries higher occupational classes have also maintained a higher chance of reaching old age. They achieved this not so much by preventing death from ischaemic heart disease but by preventing premature death from diseases that were more important in their own country, such as alcohol related diseases. The factors that allow the higher occupational classes to avoid premature death can obviously not be restricted to disease specific risk factors alone, but need to involve factors or mechanisms that determine the distribution of these risk factors over occupational classes. These “fundamental causes” 25 can be of various kinds. Recent literature has emphasised the potential importance of psychosocial stress.26-29 Chronic stress is expected to increase the risk of premature death directly through the immune and neuroendocrine systems and indirectly through adverse behavioural responses such as smoking, excessive drinking, and violence.26-29 Cultural and behavioural responses to chronic stress may vary from country to country, as is suggested by variations between countries in national patterns of causes of death. Similarly, exposure to chronic stress in disadvantaged groups may increase their risk of different causes of death in different parts of Europe. A complementary perspective emphasises the process of social achievement and access to resources. 25 30-33 Members of higher occupational classes have access to a wide array of resources, including the resources that are needed to achieve a desired occupational position (such as higher education and a favourable socioeconomic background) and the resources that accrue to those who have attained a high position (high income, job security, and sense of control).33 This enables higher occupational classes to protect themselves against premature death in a flexible way. Different epidemiological situations need different strategies for survival into old age, with the upper occupational classes being in the best position to identify and pursue the optimal survival strategies. Members of the EU Working Group on Socioeconomic Inequalities in Health who contributed to this paper are Otto Andersen, Danmarks Statistik, Copenhagen, Denmark; Jens-Kristian Borgan, Statistics Norway, Oslo, Norway; Giuseppe Costa, Environmental Protection Agency, Piedmont Region, Italy; Guy Desplanques, INSEE, Lyon, France; Fabrizio Faggiano, University of Torino, Turin, Italy; Seeromanie Harding, Haroulla Filakti, Office for National Statistics, London, United Kingdom; Maria do R Giraldes, National School of Public Health, Lisbon, Portugal; Christoph Junker, Christoph Minder, University of Bern, Bern, Switzerland; Brian Nolan, Economic and Social Research Council, Dublin, Ireland; the late Floriano Pagnanelli, National Institute of Statistics, Rome, Italy; Enrique Regidor, Ministry of Health, Madrid, Spain; Denny Vågerö, Stockholm University, Stockholm, Sweden;Pekka Martikainen, Tapani Valkonen, University of Helsinki, Helsinki, Finland. Contributors: AEK, FG, and JPM were involved in writing the paper and carried out the analyses. The other members of the working group participated in developing the design of the study, collecting data, and interpreting the results of analyses. All these coauthors have read the preliminary versions of the manuscript; most of them gave comments, and all approved the final version. Funding: European Union Biomed-1 programme (grant No CT92-1068). In: Mielck A, Giraldes M do R, eds. Inequalities in health and health care: review of selected publications from 18 western European countries. Münster: Waxmann, 1993.
eds. Social inequalities in health [special issue] Soc Sci Med 1990;31:223–40.
. Adult mortality and level of education: a comparison of six countries. In: Fox AJ, ed. Health inequalities in European countries. Aldershot: Gower, 1989:142–162.
. Differential mortality: some comparisons between England and Wales, Finland and France, based on inequalities measures. Int J Epidemiol 1990;19:1001–1010.
. Health inequalities in Britain and Sweden. Lancet 1989; ii: 35–36.
. The size of mortality differences associated with educational level in nine industrialized countries. Am J Public Health 1994;84:932–937.
. Socio-economic inequalities in morbidity and mortality in Western Europe: a comparative study. Lancet 1997;349:1655–1659.
. Socio-economic inequalities in morbidity and mortality in Europe: a comparative study. Rotterdam: Erasmus University, 1996.
. Occupational class and mortality among men 30 to 64 years in 11 European countries. Soc Sci Med (in press).
. Measuring inequalities in health: an analysis of mortality patterns using two social classifications. Sociology of Health and Illness 1996;18:455–475.
. La mortalité des adults: résultats de 2 etudes longitudinales (période 1955-1980). Paris: INSEE, 1984.
. Contribution of deaths related to alcohol use to socio-economic variation in mortality: register-based follow up study. BMJ (in press).
. Risk of alcohol-related hospital admission in men as predicted by marital status and social class. J Stud Alcohol 1983;44:986–995.
. Trends in cardiovascular disease mortality in industrialized countries since 1950. World Health Statist Q 1988;41:155–178.
. Health implications of Mediterranean diets in light of contemporary knowledge. 1. Plant foods and dairy products. Am J Clin Nutr 1995; 61(suppl): 1407–1415.
. Desigualdades sociales en salud en España. Madrid: Ministry of Health, 1996.
. Socio-economic inequalities in risk factors of morbidity and mortality in the European Community: an international comparison. J Health Psychol 1997;2:353–372.
. Tabagisme et classe social en France de 1974 à 1991. Bull Cancer 1994;81:355–359.
. Sociocultural influences on smoking habits in Switzerland. Int J Epidemiol 1987;16:624–626.
. Lung cancer: is there an association with socio-economic status in the Netherlands? J Epidemiol Community Health 1995;49:65–69.
. Equity in the finance and delivery of health care: an international perspective. Oxford: Oxford University Press, 1992.
. Socioeconomic factors and cardiovascular disease: a review of the literature. Circulation 1993;88:1973–1997.
. Socio-economic mortality differentials among adults in Sweden. In: Lopez AD, Casselli G, Valkonen T, eds. Adult mortality in developed countries: from description to explanation. Oxford: Clarendon Press, 1995:223–242.
. Changing social class distribution of heart disease. BMJ 1978; ii: 1109–1112.
. Social conditions as fundamental causes of disease. J Health Social Behaviour 1995;(Special No):80–94.
. If not genetics, then what? Biological pathways and population health. In: Evans RG, Barer ML, Marmor TR, eds. Why are some people healthy and others not?, New York: Aldin de Gruytere, 1994:161–188.
. The social and biological basis for cardiovascular disease. In: Blane D, Brunner E, Wilkinson R, eds. Health and social organisation. London: Routledge, 1996:272–299.
. Socioeconomic status and health: the challenge of the gradient. Am Psychol 1994;49:15–24.
. Some observations on health and socioeconomic status. J Health Psychol 1996;1:23–39.
. Explaining health inequalities: beyond Black and Barker. A discussion of some issues emerging in the decade following the Black Report. European Sociology Review 1995;11:1–23.
. Living on the margin: a salutogenic model for socio-economic differentials in health. Public Health 1995;109:235–243.
. Cross-national comparisons of socio-economic differences in mortality [dissertation]. Rotterdam: Erasmus University, 1997. For Britain in particular, the paper by Kunst et al is timely. In autumn the independent inquiry on inequalities in health set up by the Labour government is due to report. Its recommendations will feed directly into a white paper on public health. Systematic comparison of socioeconomic differences in mortality across countries has been undertaken only in the past decade.1-5 There are considerable difficulties in making such comparisons. 6 7 Each country has tended to use its own classification of socioeconomic position, and these are not directly comparable. The study designs have also differed: some countries have longitudinal studies while others have only cross sectional data around censuses. Kunst et al resolved the first of these issues by using a classification of class that was specifically developed by sociologists for international comparisons.8 Problems and differences in design, however, have not been avoided. As the authors admit, there may be systematic errors of over 20% in the estimates of the relative size of social class differences in three (Ireland, Spain, Portugal) of the five countries that used the cross sectional approach. Despite these shortcomings, this paper is based on the most internationally comparable set of data on social class differences in mortality ever produced. It is thus frustrating, although understandable, that many of the estimates are based on deaths that occurred up to 15 years ago. Over this period inequalities in mortality have widened considerably in Britain9 and other countries, and it is not clear whether the international rankings, in particular, are the same in the 1990s as they were a decade earlier. Although it has been suggested by previous work, the most important finding of the study is that in each country the strength of association between social class and mortality varies according to cause of death. 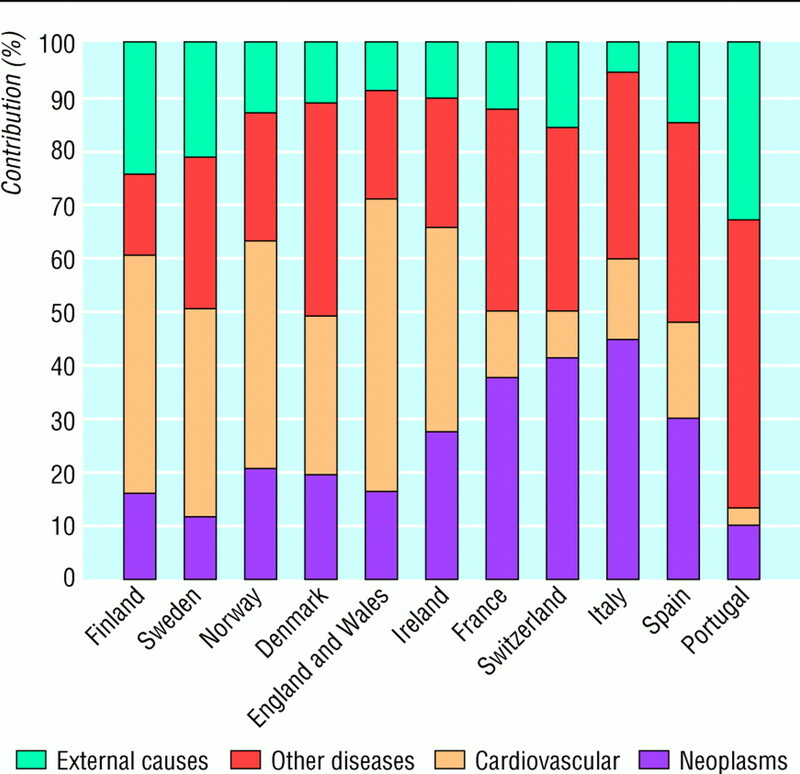 In relative terms, the largest differences are in deaths from external causes (accidents and violence), while the smallest tend to be in neoplasms (in northern Europe) and cardiovascular disease (in southern Europe). This variation by cause, and the fact that it differs across regions of Europe, does not support a direct link between stress and general susceptibility to disease. Instead it suggests that specific proximal risk factors, such as smoking or alcohol, underlie the patterns found in each country. A public health strategy, however, needs to go beyond urging manual workers to change their lifestyle and address the complex social, psychological, and economic factors that underlie these patterns of behaviour. 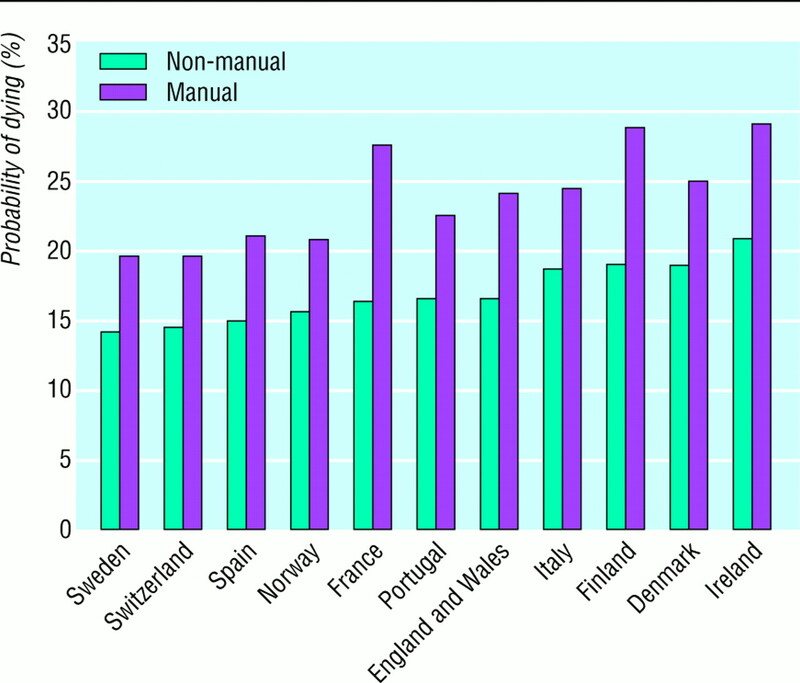 In all countries, mortality from all causes is higher in manual than non-manual social classes. In relative and absolute terms England and Wales, Finland, and France have the largest social class differences. Intriguingly, in relative terms, Sweden does not seem to be doing as well as might be expected given its postwar commitment to equity. However, if countries are ranked according to the size of the absolute difference in mortality between classes, as has already been pointed out,10 Sweden has almost the smallest difference. From a public health perspective, it is these absolute differences that are clearly the most important. At the end, the authors set about considering how it is that upper social classes seem to be able always to achieve a mortality advantage, regardless of cause of death. This question is partly generated from their conclusion that, overall, countries show similar social class differences. However, this conclusion is at odds with their own data—which clearly show appreciable variation across countries. Within Europe as a whole there is evidence of even greater variation. The former communist countries of central and eastern Europe,11 including Russia,12 show larger socioeconomic differences in mortality than do countries in western Europe. This, together with the change in size of social class differences over time, shows that social class mortality differences are far from fixed.
. Health inequalities in European countries. Aldershot: Gower, 1989.
. Differential mortality: some comparisons between England and Wales, Finland and France, based on inequality measures. Int J Epidemiol 1990;19:1001–1010. International variation in socioeconomic inequalities in self reported health. J Epidemiol Community Health 1995;49:117–123.
. Socio-economic inequalities in morbidity and mortality in western Europe. Lancet 1997;349:1655–1659.
. Problems in the measurement and international comparisons of socio-economic differences in mortality. Soc Sci Med 1993;36:409–418.
. Problems in comparing findings on social class cross-culturally—applied to infant mortality (Australia and Britain). Soc Sci Med 1990;30:1283–1288.
. The constant flux. A study of class mobility in industrial countries. Oxford: Oxford University Press, 1992.
. Health inequalities: decennial supplement. London: Office for National Statistics, 1997.
. Socioeconomic inequalities in morbidity and mortality in Western Europe [letter]. Lancet 1997;350: 516.
. Educational level and adult mortality in Russia: an analysis of routine data 1979 to 1994. Soc Sci Med 1998 (in press).
. An agenda for public health research in Europe. Eur J Pub Hlth 1998;8:3–7.